Guide your classroom in an organized sequence of learning with this all-inclusive curriculum and lesson plan guide. 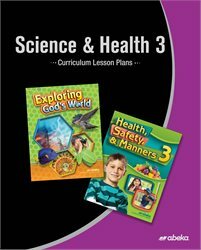 This conveniently prepared resource will help you teach 120 lessons of Science and 50 lessons of Health. Teach your class about the beautiful creation of God, presented in the order of creation and also foster good habits in their daily lives. This year in Science, your students will learn the scientific method, various systems of the body, the process of photosynthesis, classifications of animals, and any many more! Following science, your students will also learn how to have proper posture, staying clean, and fighting diseases. With a comprehensive list of objectives and teaching tips that will assist you in class preparation, hands-on experiments, review, class procedures, and application, you can be even more effective in teaching science and health! Game ideas give you extra tools to better instruct your students and keep them engaged. Use these 170 lesson plans with built-in spiral review to conduct an organized classroom for successful teaching.